In theatre the lights and sound systems are operated from a central 'board' - usually in a booth tucked away at the back or side of the theatre. Operators know the boards (control panels) inside out and use them for audio cues (e.g. loading a sound effect such as a knock at the door, a phone ringing, or background music) and lighting operation (each lighting change - e.g. lights dimming, switching off on one area of the stage and lights coming on in another area - is controlled by the board operator. They are working (usually out of sight) to give seamless scene changes and integration. Everything you see on stage in terms of the set is usually built in-house. Often sets will be built to fit the dimensions and setup of a particular theatre, though sometimes they will be more generic so that they can be used in touring productions and different theatres. The carpenter is responsible for translating the vision of the set designer into actual scenery and set. It is an extremely skilled and demanding job and the carpenter will be expected to know how best to problem solve in terms of materials, costs and labour - while delivering the best possible finished product - ready to hand over to the scenic artists and set dressers who will overlay the backdrops and constructions with the artwork and props. Part of the wardrobe department, the dresser works closely with the costumes, storing, racking, cleaning and keeping them in good repair. The other main function of the dresser is to nsure costumes are correctly moved and allocated within the theatre, getting them to the correct actors on time and helping the actors get into costume (with the possibility of costume changes within a performance this is critical). 'Flying' is when you see sections of scenery being moved (sometimes removed altogether, sometimes moved from one area of the stage to another) between scenes. These days, particularly in larger theatres and lavish (well funded!) productions, it's less about actual rope-pulling and more about working an operating board. The flyman will have a very good technical understanding of the theatre and machinery and will usually be very involved with and responsible for the loading and unloading of scenery into the required positions. The followspot is a portable light carried and operated by the followspot operator rather than a light not hung from the overhead rigging. The followspot is typically used to track the actor(s) as they move around the stage while the rest of the stage is in darkness, creating a powerful effect and one not easily achieved by the use of rigged lights (especially given that the actor's movements may vary from performance to performance so it's virtually impossible to pre-programme or track movement). Without a script there would be no plays. Without lighting the plays would be unseen. Whether it's discreet and naturalistic or dazzling and imaginative, the lighting is absolutely integral to a production. The lighting designer will work with the director to come up with the best means of representing the play through lighting. They will factor in the physical space, the equipment and rigging, the tone of the piece and the constraints of the set and then work through the possible lighting options. Lighting may be very simple if is a naturalistic rendering of, for example, the interior of a house, or complex interpretations of effects and actions suggested in the writing. The production manager keeps track of the different technical departments to ensure all aspects of the production are on track. Whereas some departments will have a degree of self containment (e.g. costume, set builders etc. ), the production manager has a more overarching view and will co-ordinate with heads of department to make sure work is coming in on time and on budget. They will be keenly focused on and responsible for the budget and will usually have a good understanding of finance. In overall charge of props, the props manager will head the props team - supervising the props makers, props sources and props buyers. Props may be sourced from any number of places including shops, websites, a theatre's in-house props department, and hired from specialised props houses (these tend to be huge warehouses with themed sections such as Victorian, Modern, Ancient etc.). Props can also be made for specific projects. The props manager liaises with his/her staff to ensure props are properly ordered, delivered, stored and maintained. Because of hire fees and terms and budgetary constraints, the purchase, hire or production of props is extremely important and often runs to a tight deadline. Scenic Artists work on the actual pieces that go to make the set once they have been designed by the Set Designer. Most theatre will have a dedicated back stage set construction and art department area where the scenery will be decorated and prepared. Usually before the set is brought onto stage for final construction each element will have been painted and finished in the workshop by the Scenic Artist. They will work with the Set Designer to try to ensure the Set Designer's vision is produced. 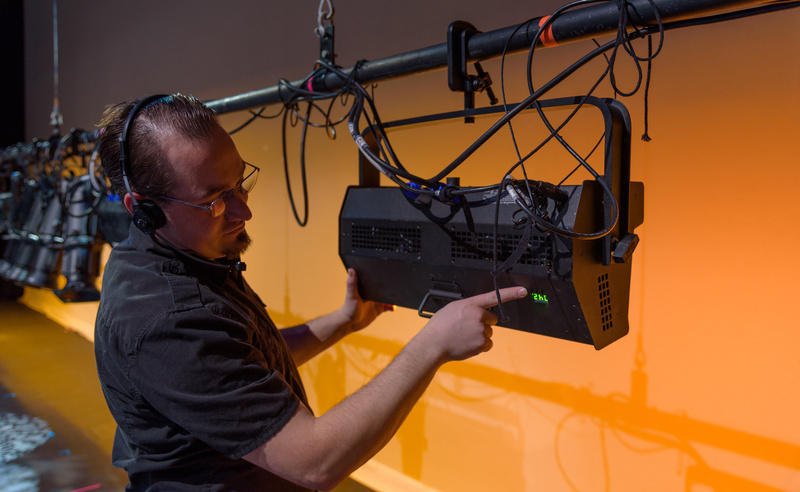 Stagehands, also known as stage technicians or crew, work backstage with scenery, props and special effects in theatrical productions and concerts. They play a vital role in any performance, by knowing exactly where and when to move objects and scenery. As a stagehand you would: load and unload equipment; help carpenters to build and put up scenery; attend rehearsals; move scenery, furniture and heavy equipment during performances; open and close curtains between acts; operate manual and automated scenery-moving machinery; clear the stage and backstage area at the end of the performance. You do not need any formal qualifications to become a stagehand. You would often start as casual backstage staff - to find work, you could approach a theatre's resident stage manager or master carpenter. Stage managers will be interested in your experience and practical skills, so you will find it useful to have experience from school, college, amateur or fringe productions. You may also find it helpful to have skills and experience in carpentry, electrical work, sound or lighting. Some stagehands take college or university courses in technical theatre or stage management before they look for work. This is not essential, but it would be useful if you want to progress into stage management or technical work like sound or lighting. Relevant courses include: BTEC National Certificate or Diploma in Production Arts; BTEC Higher National Diploma (HND) in Performing Arts (Production); degrees in stage management or technical theatre. Being a Stage Manager is essentially a "people management" job. A stage manager must have the temperament and ability to get along with people in both the artistic and technical sides of theatre, and to understand what they do. It is part of the attraction of the work that each new job will introduce new and different challenges. Once the show has opened, the stage management is responsible for the management of each evening's performance. They ensure that the production continues to run with all aspects of it kept as directed and designed. The DSM (Deputy Stage Manager) will also generally cue the show, giving calls and 'go's to the actors and all departments, enabling the changing of scenery, lighting and sound to be co-ordinated. The ASM will frequently be 'running the wings', i.e. running other backstage aspects, particularly props. Heading up the wardrobe department is the wardrobe supervisor. Working with their team of assistants and dressers (on smaller scale, low budget productions the roles may blend into one), the wardrobe supervisor must ensure all costumes are clean and in good repair. Alterations will frequently need to be made as tears and adjustments are part and parcel of performance. The wardrobe supervisor will also work closely with both costume designers and makers and the performers to deliver a wardrobe department that runs smoothly, can cope with the high demands of frequent washes and preparation, and quick turnaround between scenes and performances, and yet cater to the needs of the production and the actors. The wardrobe may be very simple (cast may come in their own clothes or have one straightforward change before each show) or wonderfully complex period costumes which require a great deal of care and maintenance.